What's New @ Roselle Public Library: VOTE! November 8, 2016, is Election Day. Your vote is important! 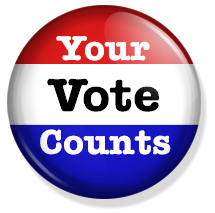 If you have not already taken advantage of early voting or absentee voting, make time to get to the polls. It is your last chance to exercise your constitutional right to cast your vote in this election. Not sure where your polling place is? Use the Village's Address Map Lookup to look up your address in the system to find your voting precinct & location, the names of your state and federal officials, and more!